If you see Fungus growing in your lawn, don’t worry, most funguses do not cause long-term damage in your lawn. Fungus is caused from wet conditions in your lawn and can be taken care of if the problem persists. At Higgins Landscape we have the products on hand to fix the problem. Many times with fertilizing the Fungus will go away on it’s on. appears in turf as small pinkish-red spots or patches, usually in later May and June when temps are high, and humidity is higher. 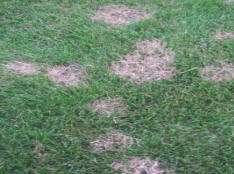 Infected areas eventually turn light tan, and the leaf tips or margins may be covered with fine pink to red threads, giving the turf an overall pink coloration. Fertilizing normally helps the situation but Higgins Landscape has products to help ad the problem if needed.